We are engaged in manufacturing and exporting a wide range of Solenoid Valves, which is largest selection of 2-way, 3-way and 4-way solenoid valves. These are designed to handle the most demanding fluid control applications for air, gases and oils.The range includes 2/2 way, 3/2 way, which is normally closed and open, 4/2 way, 5/2 way and both direct and pilot operated solenoid valves. We are widely reckoned amongst the incredible business names of the industry by providing to our customers with a broad range of Solenoid Valve. 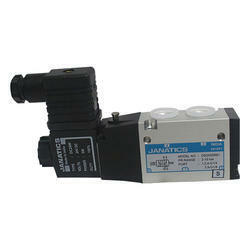 We are leading manufacturers and suppliers of Single Solenoid Valves. Available in following port sizes (BSP) : 1/8", 1/4", 3/8" , 1/2". Other port sizes can be manufactured on customer request. The Solenoid Valve gets activated when the alarm goes off. It shuts the flow of gas and thus ensures that the gas leak is stopped immediately. This device thus reduces the chance of an accident happening due to gas leakage. - General Purpose SV G 1/8" - G2"